Hatimangu Tsurugaoka (鶴岡八幡宮) or just Hatimangu Temple – important Shinto shrine in Kamakura, the most important cultural center of the city and the venue of many significant events. Founded in 1063 the head of the Minamoto clan – Ёriosi – the church was subsequently expanded and moved from its original location in Kamakura shogun Minamoto Ёrimoto. 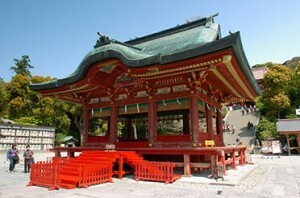 The temple got its name in honor of the guardian of the Minamoto family – the war god Hachiman. In Japan, there are many temples dedicated to the deity. 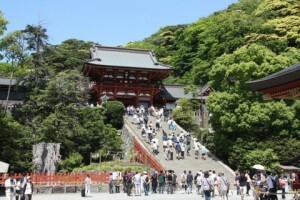 For more than 700 years since its founding Hatimangu was also a Buddhist temple. 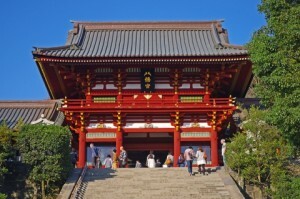 It was common, when one or the other temple combines tradition of the two main religions of Japan. But in 1868 the government decided to divide the Shinto and Buddhist shrines on the basis of political considerations, since Hatimangu considered exclusively Shinto shrine, and a large temple complex, which once included the Buddhist structure became much smaller. By the temple is very wide avenue from the coastline through the town center. The road is framed by trees on either side of the Japanese cherry. On the way to the temple you will see big Torii gate. The main building of the temple complex – the main hall Hongu – located on a hill, it leads to the long staircase at the base of which is Maiden.Maiden – a stage on which performed the traditional ritual dances. In the main hall there is a small museum, which presents a variety of valuable exhibits – samurai swords, masks, ancient documents, and so on ..
One of the main attractions of the temple was a millennial ginkgo tree, whose history is closely linked with the history of the temple and the Minamoto family. But, unfortunately, the tree died during a snow storm, which took place in March 2010. As already mentioned, the larger the number of passes Hatimangu events. In the early days of the New Year holidays the temple is visited by over 2 million. Man. Also in mid-April and mid-September, the complex holds yabusame – competition on horseback archery.